Great power with softness. Different from other giant powers, it drives speaker very sensitivly. I have used this with atc scm20 and very satisfied with its driving power as well as natural nuances. Great power, drives my B&W 804 Matrix to full tilt. Sounds full range great all the way around. Man is it heavy, about 80 lbs. Bought this unit from craigslist for $950 based on the reviews here. What a disappointment! I had an AMC CVT 2030 tube amp (30 watts)($900 new $275 on audiogon) that went dead on me so I thought that I would take the opportunity to get the Proceed fairly cheap. This unit did not have any lower end and a thin midrange. The highs, I must say, were quite nice. The AMC out performed this unit in absolutely everything for a fifth of the price! I bought another AMC on audiogon and it arrived today and my system is back to sounding nice with lush midrange, dynamic bass, and great highs that tubes are known for. The Proceed is a beast when it comes to power, but something is missing for the price that you pay. I have had a ML23 in the past and have regretted selling it so I thought that the Proceed would somehow replace it. Maybe it needs fancy cabling to make it come alive. Some systems have a synergy when put together and I am sad to say nine was not with the Proceed. My system is quite simple: Dynaco CDV2 tube cd player that goes directly to the amp and a pair of KEF 104.3 speakers. I am not bashing the Proceed, I am saying that I am disappointed that something of that quality was out performed by a simplistic 30 watt amp. Will not except banana clips, but spades work much better. HPA 2 250 Watts per channel @8 ohms. I have had this amp over a year now, still enjoying it. I have mine mated to a pair of Revel F-30 speakers and a synergistic research power cord for mega current. I love the way this amp can go to dead silence in between music material. Soundstaging and imaging is second to none. The music just flow through that amplifier so smooth. 1) Neutral presentation--no tipped up or hot highs. Yet the treble presentation is clean, clear and neat. 2) An honest midrange. Good vocalists sound fantastic on this amp and the bad vocalists, er well, we''''ll just let that one go. 3) Great bass. If the recording calls for a thunderous lowend, and your speakers are capable, then a thunderous low end you shall receive--that is, without any flab. This amp can control the bass. 4) Stays cool under fire--literally. My Proceed PAV preamp gets warmer than the HPA 2--even at high volumes. 1) The speaker terminals do not acccept banana plugs and are of somewhat chintzy construction--at least when compared with the very robust build quality of the amp in general. 2) This beast weighs 100 lbs. Though some may consider this a weakness I don''''t. No, I consider this insurance against theft. If you are an audiophile/audio enthusiast who prefers accuracy over euphony and also requires substantial power then the Proceed HPA 2 is the amp for you. In my case, I had been running a Proceed AMP 2 (150 watts @ 8 ohms) into a pair of Hales Revelation 3''''s--a speaker that falls below 3 ohms in the bass. Though, over the three years that I used it, the AMP 2 acquitted itself admirably, I sensed that the Hales required a bit more current than the AMP 2 could muster. Sure, everything sounded fine for the most part, but when I cranked the system I sensed some minor compression and a lack of dynamics in the bass. Also, I knew from prior experience that the Hales were capable of gretaer bass extension than I was getting with the AMP 2. So, I started on my search for a big amp with good sound. I wanted something that would give me more dynamics and power without sacrificing the APM 2''''s excellent midrange and treble performance. It was only natural that I would gravitate toward the Proceed HPA 2. Now, having auditioned the HPA 2 for several days, I can say that I have found MY AMP. The bass extension that I sensed was missing has been found. Now there is a solid foundation underpinning the music. The low end is at once powerful, clean, and well-controlled without being anemic. If the bass guitar purrs on the CD--then the bass guitar will purr through your speakers. Indeed, kick drums will kick and organ pipes will plunder the frequency depths. This I was expecting. What I wasn''''t expecting was the improvements wrought in the midrange and treble. The added power (we ARE talking aboout 250 watts @ 8 ohms here) has freed up the midrange and treble. The soundstage breathes. There is more space and more clarity. I''''m hearing things on my CD''''s that I''''ve not heard before. As I said, this I wasn''''t expecting. I haven''''t even been listening for it. Yet, it''''s true. The HPA 2 has exceeded the APM 2 not only in the bass and dynamics fronts, but in the mids and treble too. I''''m not referring to frequency response colorization or a lack thereof. No, I''''m referring to the width and breadth of the music. The soundstage presentation seems to have grown slightly front to back thus allowing previously hidden instruments to gain some of the spotlight. So, how do I sum up my feelings about the HPA 2? In a word, WOW! This amp has a lot going for it. It is both detailed and sweet. It has, from what I can so far tell, limitless power, for all practical purposes. When the volume goes up, it gets louder and more dynamic; it doesn't go flat. this amp compare very favorably to Levinson 331,332 and 333 amps, but the newer Levinsons do still maintain an edge. If the price of the amp is not a problem, and this is the power range you are interested in, this amp must be heard. Works especially well with Revel speakers! I've only had the HPA 2 for two weeks and it is still breaking in. But even after this short period of time, this amp sounds great. This amp does everything well in my opinion. The bass is tight and punchy, yet not overdone. In fact, compared to my previous Rotel 991, the HPA2 bass may be a little lean. The mids are well balanced, not in your face nor sunk to the back of the soundstage. Uncolored, clean, with all voices and instruments sounding like they are supposed to sound. The highs are extended and clear, but not crisp or bright. The amp handles cymbols, upper range piano and vocal sibilants well. The highs have a presence, but don't call attention to themselves like I have found on other amps. Soundstage depth and instrument placement within the soundstage is incredible. I found little difference in direct comparisons with a Levinson 335 on Revel Salon speakers. The amp is very quiet, the music is effortless against a completely dark background. I have found the balanced mode to be quieter and has better image separation and focus. I am using Nordost Red Dawn balanced interconnects. I can already tell that this amp will stay in my system for a good long time. In fact, it sounds so good, that I no longer have the itch to upgrade my speakers. At $3200 retail, this amp is not cheap. But with a discount and a trade in, I ended up paying only $1900 which I consider to be a great deal. Highly recommended. I recently bought the Proceed HPA 2 + HPA 3. After already owning the Proceed AMP 2 + AMP 3, I decided to sell them and was really looking forward to getting the HPAs. Now, after listening to the HPAs, to me they sound about the same, but can play a little louder. The HPAs are a lot heavier, look different and cost more than the AMPs I had, but am I supposed to notice any sound differences? I am not a sophisticated audio-freak who thinks using different AC power cables makes any sound difference or any of that garbage, but I like quality and solidly built products. The HPAs are great, but I just don't hear any difference from my old AMPs (except volume). 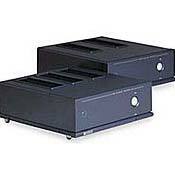 My recommendation is this: if you want a great 2 and 3 ch amp, buy the Proceed AMP 2 and 3. If you want amps that look like HPAs, buy the BPA 2 and 3 (they are similar to the AMP series, with a complete cosmetic makeover and a few internal changes - ie. output transistors are the same as HPA, AMP 5 and ML 33H). If you want louder Amp 2 and 3s, buy HPA 2 and 3s. Does everything right. superb imaging and clarity, even on the most complex mixes. This amp continues to amaze me every time I listen to it. Individual instruments sit precisely in space no matter how complex the passage. Timbre is true throughout the audio spectrum. The amp has remarkable detail and busy mixes allow you to pick out any instrument and listen no matter what else is being played. At 250 watts it has ample power for any conceivable home listening scenario. In addition to its superb sound, it also is well a thought out and well built amp. Yes it weighs almost 100 pounds, but it never runs hot due to its top ventilation and huge internal heat sinks. I also like the fact that I can flip a switch and listen to balanced or RCA inputs. The levels are matched too which means you can change the inputs on any channel without adjusting the volume. It is a little on the pricey side if you buy new. However, on the used market I have seen these for around $1800 which makes it an absolute steal.